You can order a queen mattress bag from Moving Ahead Services so that you can safely pack your mattress during a move. Our queen mattress bag will hold any queen-sized mattress and protect it from any seasonal conditions such as rain and any dirt, dust, or grime that may rub off from other objects or from the inside of your chosen vehicle. By placing your mattress in a bag, you are protecting it not only from substance-based damage but any tearing that may occur as a result of rubbing against surrounding objects with sharp edges. With a queen mattress bag, you won’t have to worry about rain or snow and you or your hired movers will be able to lift, load, and carry the mattress without as much trouble, as you will be able to grip the bag a lot more easily than you would be able to grip the mattress. The bag is made of thick plastic that will shield your mattress from all unwanted substances and remain firm against rips or tears, so you can rest assured that it will stay sturdy. Mattress bags are often a forgotten portion of packing supplies that people don’t think about until they are actually about to move the mattress from the home to their vehicle, resulting in the mattress either being given makeshift protection that doesn’t work or going completely unprotected. 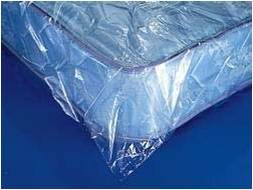 If you order one of our queen mattress bags, however, you will be fully prepared and your mattress will be guaranteed its safety to maintain its excellent condition. We encourage you to allow our certified staff to handle your move for you so that they can use their in-depth training to make sure that your mattress is not dropped or a source of any sort of injury.